The Food and Drug Administration's announcement on bisphenol A is a baby step for BPA, and a huge leap forward for the FDA. After several delays, the FDA announced on Friday (16 January 2009) that it has revised its assessment of bisphenol A. The agency now acknowledges it has "some concern" about BPA, particularly with respect to developmental and reproductive effects in infants and children. This puts the FDA in agreement with the National Toxicology Program (which reviewed studies through to 2007... so it is missing guidance from many recent studies), and is a dramatic reversal from years of insisting that BPA is safe. 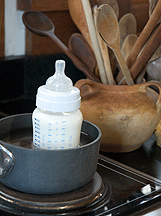 FDA now warns against very hot liquids in baby bottles. This is a big deal. BPA can be found in almost all Americans. Approximately 8 billion pounds are produced annually. The revenue stream from BPA is estimated to be over $700,000 per hour. It's used to make polycarbonate plastic, to make an epoxy resin that lines most cans on supermarket shelves, and to make carbonless paper used in approximately one half of the sales receipt machines in the US. Because carbonless paper is recycled, this means that the recycled paper stock, and the recycled cardboard paper stock, widely used in the US is profoundly contaminated by bisphenol A. Uh oh. With the FDA's announcement, industry lobbyists can no longer claim, as they are so fond of doing, that all health agencies have concluded BPA is safe. Most scientists actively involved in BPA research would observe that this is a baby step in the right direction: good, but insufficient. Not only does science now link BPA to a broader array of potential problems following fetal and early life exposure, multiple studies now indicate that BPA is also a health risk for adults. Much of the information on this has come since NTP completed its analysis. Just this past week, for example, scientists analysing the CDC's NHANES database replicated work published in 2008 showing a BPA association with heart disease. Multiple studies now also indicate it interferes with treatments for breast and prostate cancer, as well. Neither the NTP's assessment nor the FDA's announcement address these scientific concerns. Clearly the FDA has a lot to do to catch up to the science. None of their recommendations on Friday were relevant to adult exposures. Yet today's science tells us that is important too. But I have to give the FDA credit. This announcement is a huge departure from previous work... not just in the details of their conclusions but in the process they used. And that's where it gets exciting, with implications that go far beyond BPA. The FDA's new finding of 'some concern' means they are now willing to look at all relevant data instead of adhering rigidly to 'guideline compliant' research (see below). This is huge. It moves the FDA toward the 21st Century. They're not quite there yet, but the decision to look at all relevant data will have repercussions for all of FDA toxicology, not just BPA, and that is good. The crucial difference that had separated the NTP finding of 'some concern' from the FDA's prior insistence on safety had been that the NTP used data from a wider array of scientific publications, whereas the FDA used only industry-funded 'guideline compliant' research, and dismissed hundreds of studies by NIH/NIEHS funded researchers. The FDA concluded that these other studies were not reliable by applying 3 criteria: they failed to adhere to "Good Laboratory Practices," they used non-standardized assays, and sample sizes were often small. At first blush it might appear reasonable to stick with research that follows "Good Laboratory Practices, if you are unaware of the details and history of "Good Laboratory Practices" (GLP). The implication would seem to be that if a study doesn't follow GLP then they must have used "Bad Laboratory Practices." That's not the case at all. GLP standards were implemented by the FDA and EPA in the 1970s after a wave of scandals over fraudulent data submitted by contract laboratories for regulatory purposes. GLP standards were designed explicitly to prevent fraud, not to ensure reliable science. They are mostly about record taking, sample storing, etc., so that, if necessary, regulators can track the details of the study. Ironically, independent scientists have found scientific errors in each of the GLP studies that the FDA had based its earlier decision upon. This is analyzed in detail in two publications in Environmental Health Perspectives (link 1, link 2) (I was a co-author in each). So while GLP may guarantee record keeping, it does not guarantee scientific quality. Up until now, FDA has based its regulatory analyses on research done using standardized assays. As with GLP, that sounds good when you first hear it. Standardized means that they have been validated and that standard procedures are used to conduct the tests. But for an assay to become standardized can take a very long time, and that means that many of the standardized assays have been in use for decades. Those old assays reflect the state of science long before today's tools in molecular genetics and other modern fields were developed. With the current pace of biological research, most of the standardized assays are crude compared to what biomedical researchers use in basic research today. Depending upon standardized assays and excluding the analytical tools that have developed in toxicology over the past decade is like using binoculars instead of the Hubble Space Telescope to study distant galaxies. And concluding, based on standardized assays, that something is safe when modern assays reveal concerns means that regulations will always be based on old science that doesn't reflect today's understanding and analytical power. The FDA's 2008 BPA assessment disregarded many academic NIH funded studies because they didn't have 20+ animals in exposure and control groups. This is statistical nonsense. Calculations of significance take into account the sample size. Smaller sample sizes need to have greater differences between control animals and experimental animals (or less variability within groups) to reach the same level of significance of larger sample sizes. A small sample size biases the experiment toward not being able to find an effect, not toward finding an effect. Requiring large sample sizes also biases the toxicological assessment toward industry-funded studies and away from NIH funded research. That's because NIH, by law, funds its researchers to use the minimum number of animals necessary. Researchers must use standard statistical procedures to estimate how many animals an experiment will need... it's called a 'power analysis'... and NIH prohibits funding of sample sizes larger than necessary. So if your preliminary data indicate you can find an effect with a sample size of 6, NIH won't fund you to use bigger groups. Another crucial element of this announcement was the direct and full involvement of the National Institute of Environmental Health Sciences (NIEHS). The conference call organized by the Department of Health and Human Services to announce the FDA's position included Dr. Margaret Hamburg, FDA Commissioner, and Dr. Linda Birnbaum, Director of NIEHS. This is a level of cross-agency collaboration that has long been needed. It will dramatically facilitate getting the FDA access to the best, cutting edge science available. Birnbaum's statements on the call also indicate that NIEHS is working hard to increase the value and relevance of its research for regulatory decisions. The NIH/NIEHS funded studies could also be improved. Some of the bigger labs could become GLP-certified. They could do a better job at characterizing the dose-reponse curve with more attention to generating a full picture of how response varies across a wide range of doses. And NIEHS could be more generous in its funding of study replications. Lack of precise replications has been a recurring problem in this field, with the advanced assays showing consistency in general but often lacking exact replication because the funding hasn't been available. Occupational exposures also need much more attention. A recent study from China revealed strong associations between BPA exposure and adult sexual dysfunction in male factory workers. We need much more work here, but to date OSHA and NIOSH have been missing in action. What is happening to American's working in BPA production facilities? Or to people working check-out counters who are handling BPA-based paper receipts all day? And to their children? So bottom line, this FDA announcement about BPA is a big step forward for health. It doesn't go as far as it should on BPA--most notably with respect to protecting pregnant women and adults-- but it signals strongly to manufacturers that they should be working hard on replacements. They also provide specific information for consumers about how to reduce exposures. But the bigger implications are for what it foretells about the FDA's approach to assessing risk and its move to incorporate 21st Century science into its regulatory decisions. That's good news for public health.